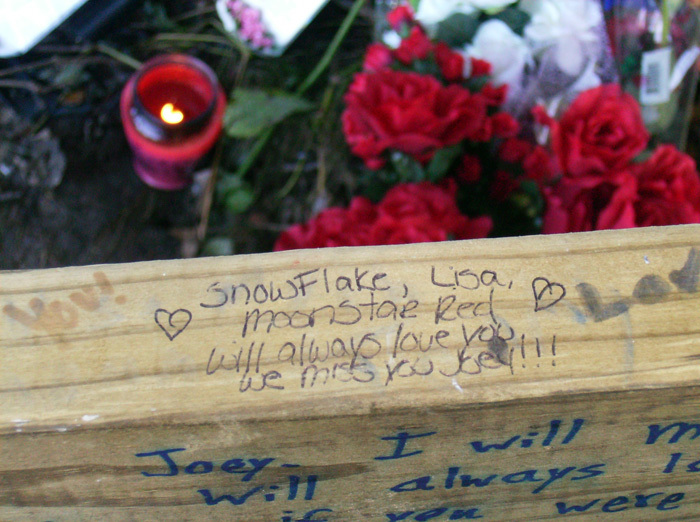 It was September 13th 2008 when I got the message that my friend Joey had passed away. He was in an auto accident. I never actually met him in person; we only spoke through a website. On his profile, he had a few songs, but only one that made me cry every time I visited his page. When I heard about his death, I contacted my cousin, who also spoke to him through this website, and we set out to travel across a couple of states to his funeral. I also brought my son with me. We arrived 15 minutes after it supposedly ended due to a highway closed down from the recent rain. Since we arrived late, we decided to go to the location of the car crash. (The site was posted over a bulletin board). The town where Joey lived was very small, and the streets weren't lit up, so it was easy to get lost. We drove around for about an hour, and still couldn't find the site. We came across the same 4 way stop when I decided to drive straight ahead instead of turning down the same road we kept turning on. After this decision, Joey's profile song popped in my head. (I hadn't thought about this song for a few hours). I told my cousin we were getting close. I spoke to his mother the next day, and asked her if he ever smoked. She said yes. I was silent. I think because I scared myself that I actually saw him, and no one else did. Can't enlarge the third picture on the bottom right, but where exactly is Joey standing, I see nothing. But I do detect a lot of peace. You also say you never saw Joey, so how do you know it was him. I have asked this before. Heyy aw bless youu hunn. I think the fact that you heard his profile song pop into your head and then saw him, that you actually did see something of your friend. Since you only chatted with him on the internet, I am wondering how you would know this person smoking was actually his ghost. Even seeing a few photos online, it would be difficult to be sure (even using a webcam does little justice to an actual person). Perhaps it was just someone out there having a cigarette (MANY people smoke). I would have to say this may have just been a case of mistaken identity, but if it was him, then he was kind enough to say goodbye to you even if you never really knew him. Agreed. It's a final goodbye and to let someone know they are alright. A classmate of my niece's died in a car accident before they were to graduate. While going down this road my niece and her 3 friends in the car saw this person walking down the road, they pulled over thinking it was someone they knew who needed a ride. As the person got closer they saw that it was indeed their friend who had died. As teenage girls will do, panic set in and they took off. A few hundred yards down the road they turned around and went back. They figured it just had to be someone that looked like him. Ofcourse when they returned to the spot no one was walking the road. They saw another friend passing and called him to ask if he had seen anyone walking the road. He had not. Teenage imagination mixed with grief? I don't know. They all described the same thing so whatever it was they all saw the same thing. Thanks for sharing. I had something happen to me about 10 years ago. I had moved to the Central Coast of Cal. From the Central Valley (about 150 Miles). I continued to buy my home town newspaer in my new town. One day I bought it and noticed that my old therapist who had helped me immensely had died. She was only two years older then me. I started crying and cried myself to sleep. I woke up and saw her (Shan) hovering on the side of my bed. I could only see her top half. She had a huge compassionate smile on her face. I watched her for awhile then peacefully went back to sleep knowing that Shan was safe and that she had contacted me. Thank you for your comments. I really do appreciate them 😁 I was planning on going back in the summer. I would love to see his mom again, for her, and I became friends since that night. I know he wanted me to see him, because the look on his face was as if he was telling me "it's about time you got here". I think it was a last goodbye from him. I went to the site the next morning after we've arrived (we stayed in a hotel) and there were some people around, so I never saw him again, or thought about contacting him. I'm sure if it was just me, my son, and my cousin, I would've tried to contact him. 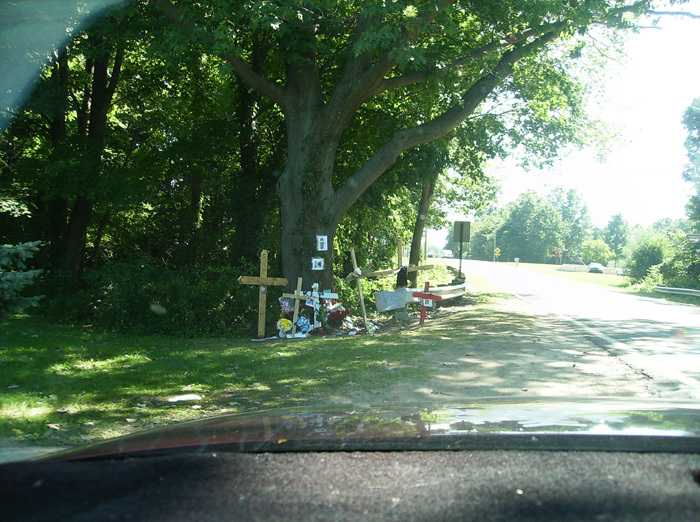 But it was us 3, plus Joey's mom, grandmother, and 2 more school-aged girls where the crash took place... I have pictures of the site, in fact my car's in it too,lol. I need to find out how to post them on this site. You won't ever forget that moment. He wanted you to see him it seems. ~ Thanks for writing about it, to share your experience. © The ghost story Never Met Him But Had Some Sort Of Bond is copyrighted to snowflake. Edited by yourghoststories.com.